Russell Anderson’s art and design practice is focused on whimsical kinetic sculpture, play and interactivity from small to large-scale, in both private and public settings. This has extended into playground design and manufacture of play elements. Russell has been a full-time artist for 20 years in public art commissions, community projects, theatre design and festivals. He lives with his partner – jeweler Rebecca Ward – and their daughters Ren and Rata on acreage bordering a national park, in the hinterland of the Sunshine Coast, Australia. 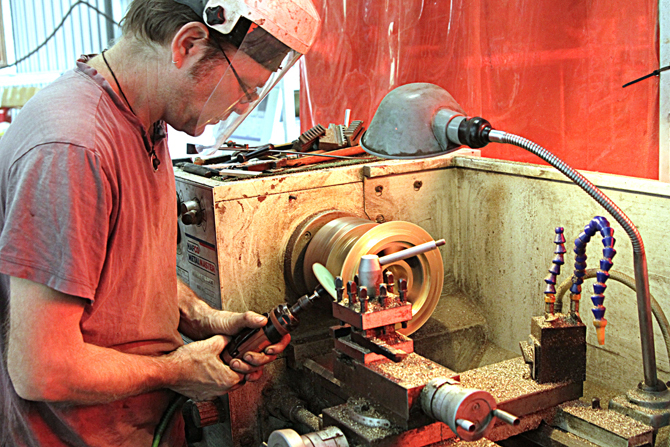 His off-the-grid completely solar powered workshop/studio is equipped with CNC tooling and a full machine shop. Russell strongly believes that a person should be able to access and appreciate art and design without having an arts degree. This does not mean that artwork cannot be challenging. He addresses this issue in his artwork by providing multiple access points including high quality workmanship, visual aesthetics, strong lines, attention to detail, narrative, sense of whimsy, complexity and the balance of form and function. Russell has a Bachelor of Fine Arts (Honours) as well as a Master of Arts through Queensland University of Technology.